Now that the winter snows are upon us, I’ve been focusing on some “inside” activities that we can do as druids. 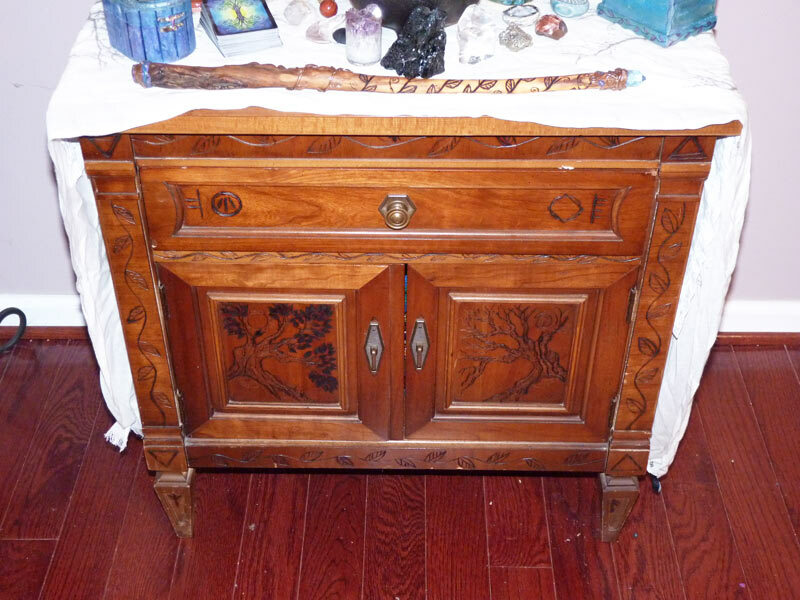 I had a few friends new to the druidic and earth-centered path ask about the purpose and setup of a druid altar. I want to start by reiterating that druidry is a very personal path. While there are things that all druids do agree on (such as a spiritual connection to the living world, a reverence and respect of nature, and finding inspiration from the ancient Druids in the past) there is also much that is personally determined (such as belief systems, relationship to divinity, etc.) 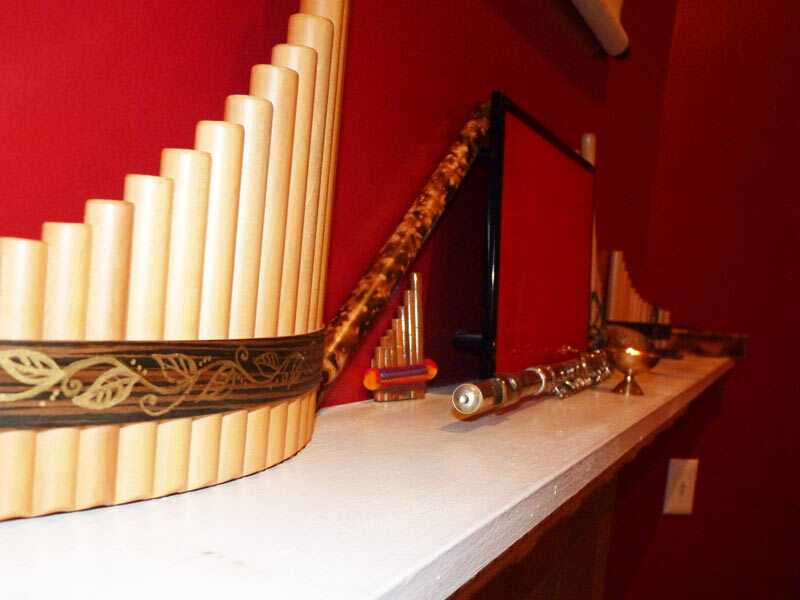 Because of this, a lot of the way you set up a personal altar and/or shrine is based on your own specific belief path. With that said, having some examples and pointers are still very helpful! What is an altar? What is a shrine? Why do druids have them? Let’s start with some definitions. Traditionally (and I mean traditional in terms of world religions, not druidry) an altar is a place of offering, where offerings are left for a specific purpose. A shrine, on the other hand, is a place of spiritual significance, where veneration, respect, worship, or homage is paid. So an altar might be at/near/on a shrine, for example. Druids often refer to “altar” to describe both of the above. 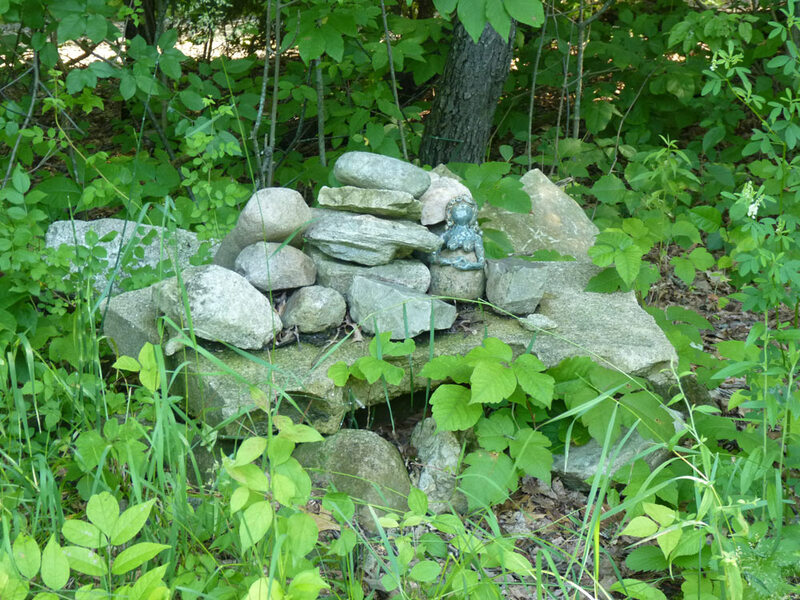 I’m going to use altar as its the more common term within druidry (despite the fact that not all druids leave offerings–although I believe the majority of us do). Druids of create an altars for various reasons. 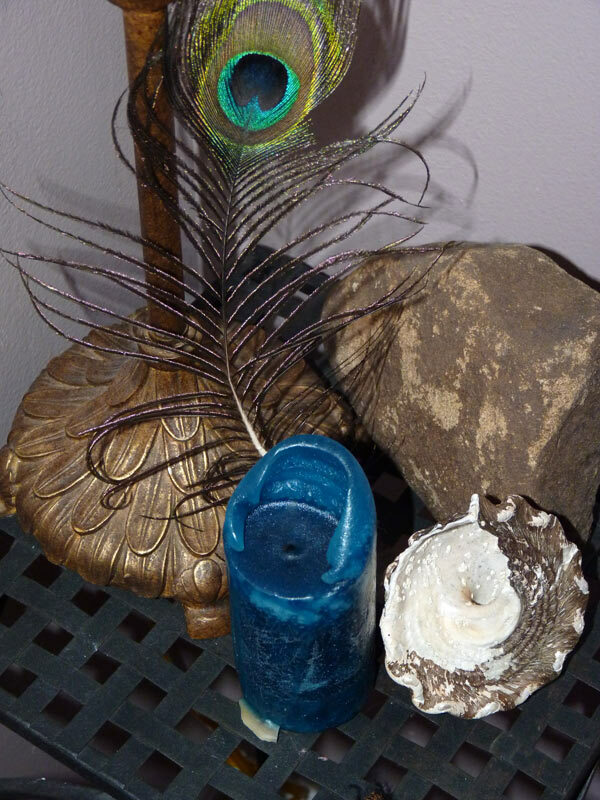 First, an altar is a dedicated space for an outward expression of your internal spiritual journey. If you engage in daily meditation or other activity, or for when you are doing ritual work, its useful to have a space to visit. 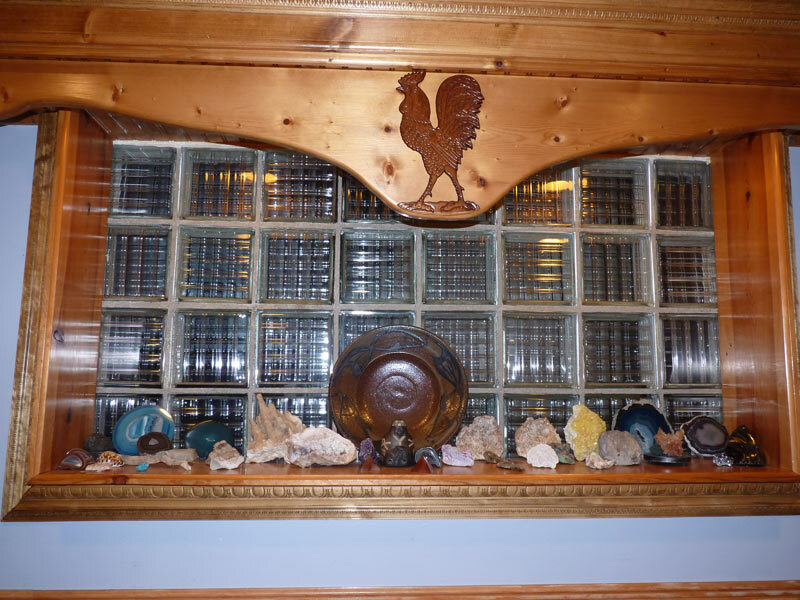 Its also good to have a place to put objects of significance, such as stones or feathers, and it can be added to as you go about your spiritual path. Here’s a closeup of my main altar stand, which I woodburned. Another concept I’d like to introduce is the idea of evolving, growing altars. 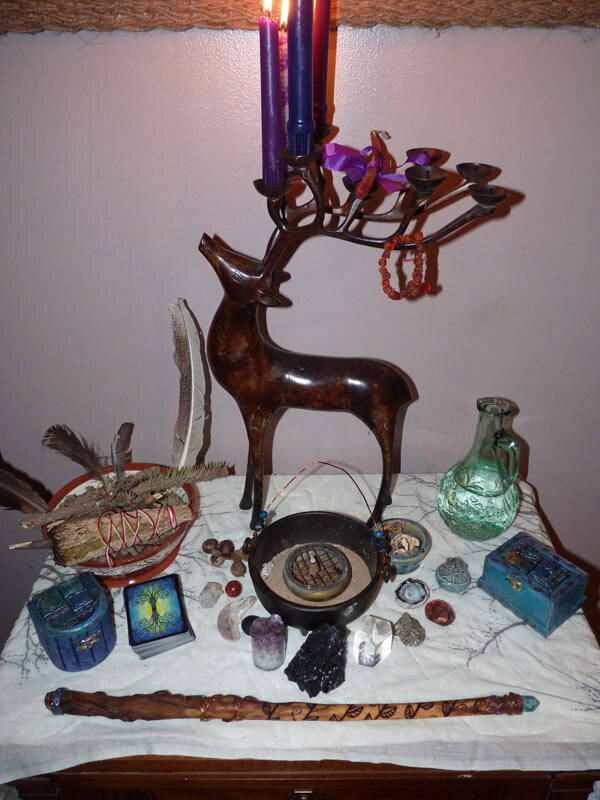 When you start setting up an altar it is very likely that its not going to have everything that you hope it will have and its not going to look the way you want it to look. Time works in your favor here, and nature (and other fellow druids, family, and friends) have a way of giving you things that may eventually end up on an altar. This means, again, that going out and buying everything new to make your altar perfect sort of defeats the purpose of having it. Not to mention, as I’ve blogged about before, that compulsive consumerism is a habit that anyone in an earth-centered path needs to start avoiding. Your altar is supposed to evolve, to grow, as you do. And that’s part of the experience of creating one. What goes on an altar/shrine? Now that we know what an altar is, what do you put on it? I’d like to take this opportunity to once again point out that as earth-centered, spiritual people, we should also be making sure that what goes on an altar minimally impacts the planet. This means, if at all possible, it should be gathered/grown/made/found, given as a gift, purchased from a local artist, or purchased used, rather than purchased new. If you are gathering things from nature, make sure you have permission (and there are multiple kinds). This is for several reasons, but mainly from a spiritual sense, where an item comes from determines, to some degree, what energies it has associated with it. Would you rather have the energies of a peaceful ocean or a forest stream, or the energies of a chaotic Target or Walmart? But I think its also about personalization…you will be able to find things, over time, much more effectively. My main working altar, as shown in the photo below has a lot of different objects. I very recently acquired the bronze stag candelabra as a gift which really makes the whole thing wonderful (and for the record, I’ve been hoping for a centerpiece for my altar for years and years). I also have branches from trees, some earth in a cauldron, water from a recent ritual, incense, tarot cards, various stones, and my wand. Everything has a purpose in being there. I hung a piece of artwork–the circular tree made out of natural materials–behind the altar. The artwork was purchased at a fair trade gift fair a few years ago. My main altar, as I described above, is a small nightstand. 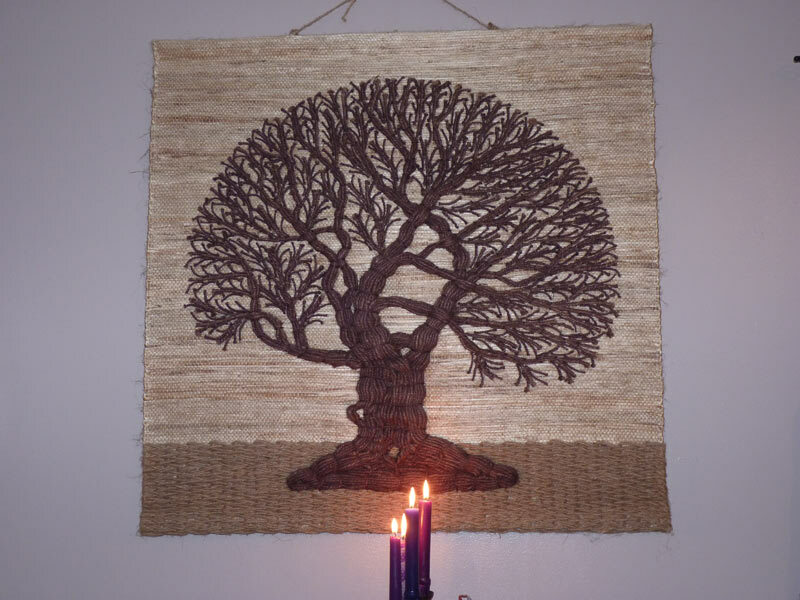 Upon this I put an altar cloth that I change based on the seasons (white representing snow/cold in winter; pale blue/green in the spring, bright/deep green in the summer, purple and gold in the fall). Since I took this photo near Alban Arthan (the Winter Solstice), I have a white cloth for the season. On my main altar, I usually also try to include a symbol of the season (so at Alban, I might go out and get a bowl of snow, let it sit till it melts and eventually evaporates; acorns or pumpkins in the fall, seeds in the spring, etc). 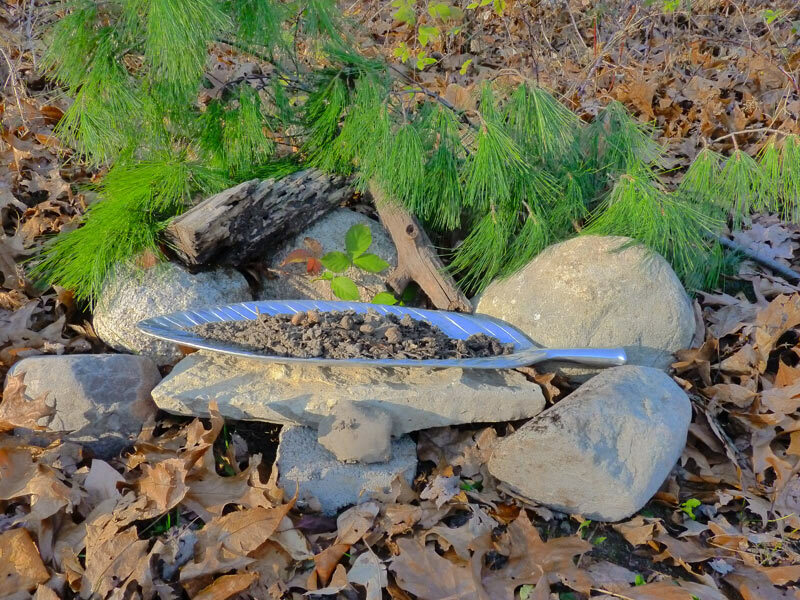 A lot of druids change their altar for each of the eight holidays in the wheel of the year–and I think this is a great practice too. I usually change mine at the four fire festivals, but that’s just a personal choice. Alban Eiler (Spring Equinox) / March 21st: Colors: Light green, light yellow. Items: Sprouting seeds (I like to sprout plants that I will put in my garden, I leave them on my altar for a few days); sprouting branches, a bowl of spring rain, eggs. Alban Heruin (Summer Solstice) / June 21st: Colors: Bright yellow. 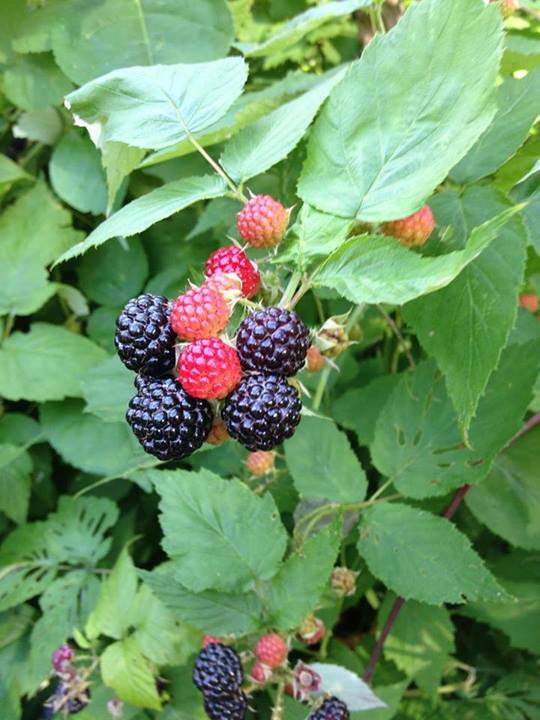 Items: Freshly gathered herbs (the summer solstice is a fabulous time for herb gathering), early fruits, veggies, leaves, etc. Alban Elued / September 21st: Colors: Gold, tan, browns, orange. Items: Pumpkins, bounty from the garden, acorns, fall leaves in full bloom, nuts, corn, etc. 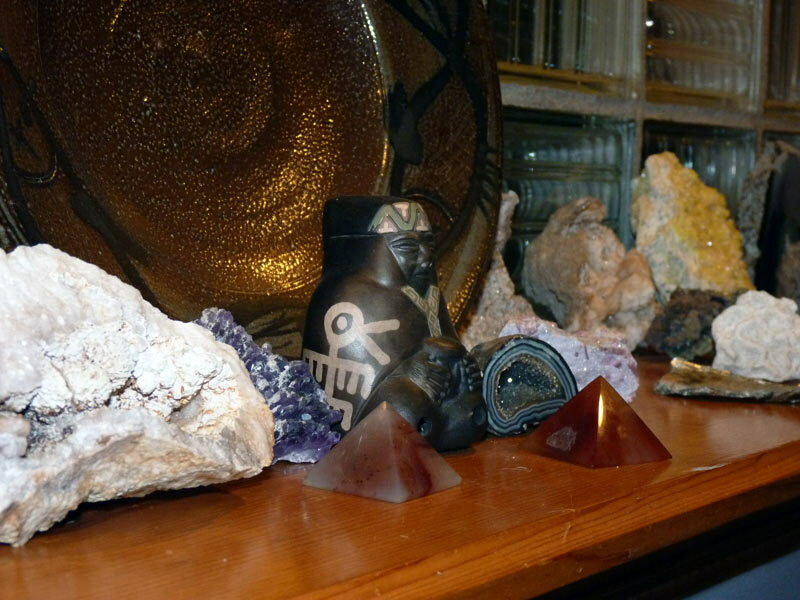 In addition to my main altar, I’ve found it really beneficial to have elemental shrines in various parts of my house–these shrines are specifically placed to bring the right kinds of energies to the right kinds of spaces. Some of these shrines are more obviously shrine/altar-like than others. Two of them may not even be recognizable as shrines, but they still are :). 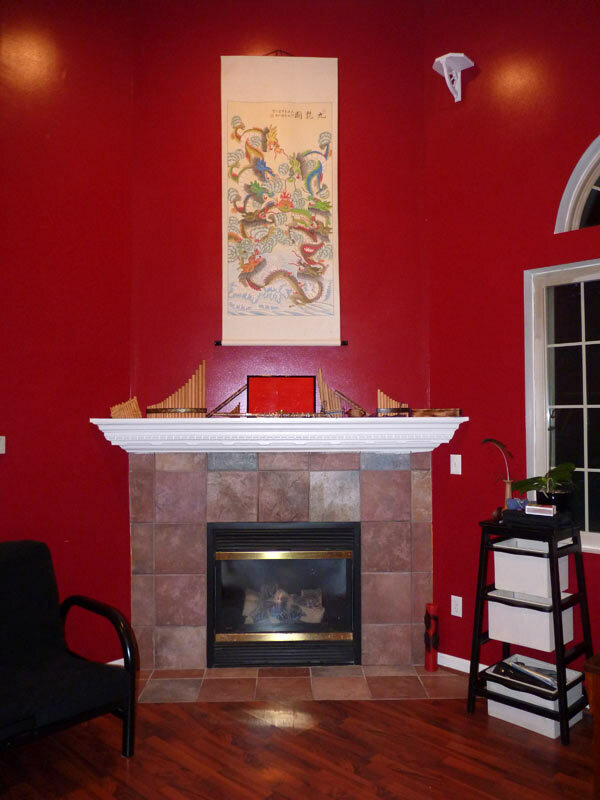 This altar is above the mantle in our greatroom; the whole room is very air and fire based (its very open and light, and painted red with a fireplace). This is also where I do a lot of my academic work (writing, research, teaching, grading) and so fire and air are the two elemental qualities that are the most important to that work. If I get burnt out, I do retreat to the earth room (where my main altar is) on occasion :). This is the earth shrine, and it sits in our kitchen. The kitchen, to me, has the most earthy energy of the house (its also partially underground, and made of stone and wood), and I wanted to bring even more good earthy energy there. 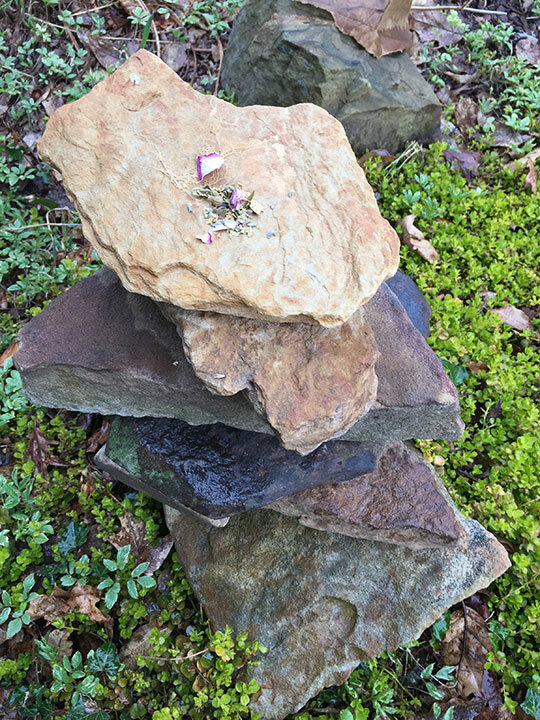 Not everyone would recognize this as an shrine (they might see it as just a rock collection–and its both!) A lot of these stones we found in Indiana, North Dakota, or Pennsylvania. This is my water shrine. 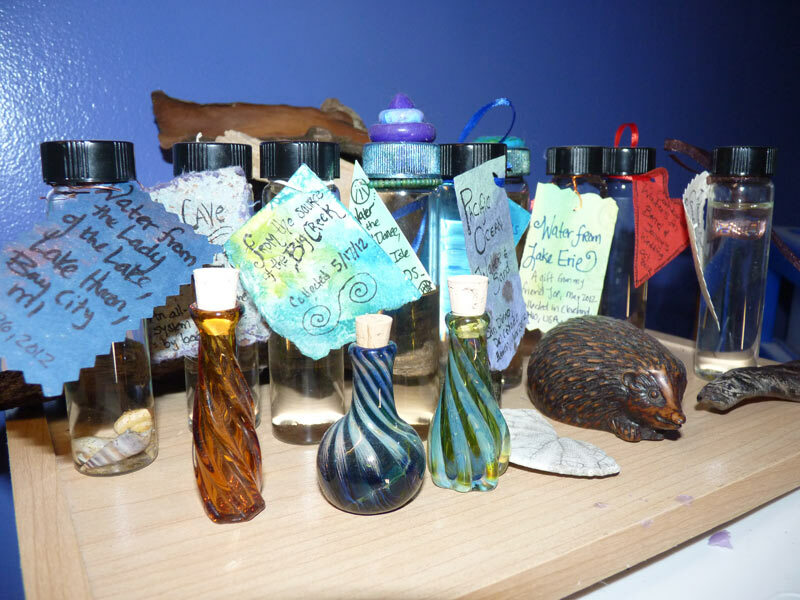 About a year and a half ago, I became very dedicated to the element of water after participating in a water-focused ritual at the OBOD East Coast Gathering 2011 and receiving a gift of water from Iona, the Isle of Druids, from a fellow OBOD member. At that point, I started collecting water wherever I went….and now I have quite a collection! I have this sitting on a small shelf in my art studio. While not all of my art is watery, per se, watercolors are my favorite media, and I do a lot of painting. I also have an elemental balance shrine, with all four elements. I also maintain a spirit and ancestor altar in my home. This altar honors my past ancestors (ancestors of blood, ancestors of the land, and ancestors of my spiritual tradition) as well as my spirit guides. I created a painting of spirit guides and also have photos of my ancestors. That altar is a bit private, so I’m not showing a photo of it.